What: We will calibrate high-resolution carbon isotopes and growth rates in freshwater mussel shells as proxies of ultra-high-resolution (paleo)environmental conditions and then to apply these proxies to shells spanning the K-T boundary collected in Montana during this project. The K-T is associated with an asteroid impact leading to the mass extinction, which ended the rein of the dinosaurs. Previous work suggests pre-impact environmental perturbations leading up to the K-T boundary, but seasonal variations in the carbon cycle have notbeen investigated. High-resolution seasonal variations in carbon cycling can provide more subtle information than the time-integrated approaches used in the past. Where: The project will take place in three phases. In Phase 1 (~7 days), we will collect fossil freshwater mussels from various sites in Montana from sediments bracketing the Cretaceous-Paleogene (K-T) Boundary. We will be travelling in the backcountry of Montana, camping as we go. In Phase II (~10 days), we will conduct calibration experiments on living and recently killed mussels at the Columbus Zoo Mussel Research Center. These experiments will be designed to help decode the environmental signals preserved in the fossil shells. In Phase III (~10 days) we will conduct analytical work on modern and fossil shells. These analyses will take place at both Denison (Ohio) and Union (New York). Who: A team of six students with Professor David Gillikin (Union College) and Professor David Goodwin (Denison University); Professor Joseph Hartman from University of South Dakota will assist in the field while in Montana. Reconstruct patterns of intra-annual growth from freshwater mussels grown in under natural and controlled conditions using high-resolution records of environmental variability. Calibrate the fidelity and resolution of geochemical proxies through comparison of shell geochemistry with high-resolution records of environmental variation. Reconstruct fluvial biogeochemistry before and after the K-T mass extinction event. In Montana, the boundary between the Hell Creek (Upper Cretaceous) and Fort Union (Paleocene) Formations straddles the famous K-T boundary (Lund et al. 2002) associated with the end of the dinosaurs. These formations were deposited in a broad fluvial fine-grained flood plain dissected by meandering sediment rich rivers (Fastovsky 1987) and contain a wide diversity of freshwater mollusks (Hartman 1998, Scholz & Hartman 2007). Shells from these sites are geochemically pristine and therefore hold their original geochemical signatures (Dettman & Lohmann 2000, Fan & Dettman, 2009). The latest Cretaceous was a warm period in earth’s history and the floodplains that developed in the Western Interior of North America were rich with life, including dinosaurs and dense vegetation dominated by angiosperms (Fastovsy 1987, Retallack et al., 1987, Retallack, 1996; Johnson, 2002). The Hell Creek paleoriver system drained the northern Rocky Mountains and flowed through lowland closed canopy forests into the Western Interior Seaway (Retallack et al. 1987, Retallack 1996; Johnson 2002, Scholz & Hartman 2007). Freshwater mussel shells that grew in this paleoriver system can provide information on seasonal environmental variability. The proposed research will investigate the high-resolution environmental variability in the latest Cretaceous, as well as fluvial carbon biogeochemistry after the recovery interval (~500,000 after the extinction event; Hartman, pers. comm.). Carbon isotope calibration: Several projects could stem form the carbon isotope calibration study, for example: 1) the impact of metabolic carbon on shell δ13C (see Gillikin et al. 2006, 2007), 2) impact of growth rates on shell δ13C (see Gillikin et al. 2007), 3) cross-calibration with other environmental parameters (e.g., pH, Chl a; see Gillikin et al. 2006; Goodwin et al. in press). To determine the impact of respired carbon on the shell signal, a simple mixing model between respired carbon and environmental carbon will be used. To calculate the respired carbon end member, a respiration experiment will be carried out. Respiration experiment: All previous research on the amount of metabolic carbon in mollusk shells has estimated the δ13C value of respired carbon. The δ13C value of respired CO2 has been assumed to approximately match the δ13C of the respiring tissue (McConnaughey et al., 1997). This assumption, if wrong, could bias calculated metabolic carbon contributions (see Poulain et al., 2010). Mussels will be held in respiration chambers and water chemistry monitored to calculate respiration and the δ13C value of respired carbon. Reconstructing patterns of intra-annual growth: Bivalve mollusk shells contain valuable archives of biological and environmental information. Students will take advantage of a new numerical model that reconstructs intra-annual growth rates by relating linear growth and time using oxygen isotopes from shell carbonate (Goodwin et al. 2009, Paul & Goodwin 2009). Reconstructed growth rates, in turn, provide valuable ecological information, such as the timing of highest intra-annual growth rates, growth-limiting temperatures, and optimal growth temperatures. Paleolandscape reconstruction from stratigraphic analysis: Students will measure stratigraphic sections at three horizons in the Cretaceous Hell Creek Formation in Garfield County, Montana. The measured sections will provide a constrained stratigraphic context enabling students to link intra-annual geochemical variability with specific depositional environments. We will also collect Paleogene specimens from sections in the Fort Union Formation deposited approximately 500,000 years after the K-T extinction event. To extend our collections closer to the recovery period, we will prospect for new Paleocene shell localities in appropriate lithofacies adjacent to the K-T boundary and also possibly visit the K-T boundary itself at the Iridium Hill locality (pending landowner permission). Reconstructing carbon cycling before and after the K-T boundary: We will investigate intra-annual shell carbon isotope profiles from specimens collected below and above the K-T boundary. Shells will undergo extensive diagenetic screening including cathodoluminescence and SEM imaging, XRD analysis, and trace-element analysis. Shells will be sampled over one complete annual increment, thus providing a seasonal record of geochemical variation. We expect the seasonal δ13C signal in these shells will provide insight into the larger scale fluctuations seen in the organic sediment record and may help understand why bivalve species went extinct before the asteroid impact. For the first week of the project we will be traveling around South Dakota and Montana in a 12-passenger van and will sleep in tents. You can expect cold evenings and hot days. We will be in remote field locations, far removed from populated areas, with limited opportunity for communication with friends/family and lack of electricity and refrigeration. We will be trekking into the backcountry with daypacks to collect samples, which will include strenuous hiking and steep terrain. Students will need their own camping equipment and backpacks. We will be in hotels or dorms in Ohio and NY. Students will make a multi-leg trip to North Dakota, Columbus Ohio, and Albany NY. We can supply up to $1000 for airfare for each student. Historical Geology, Sedimentology and Stratigraphy, and a course in Chemistry or Biology; courses in Paleontology and/or Geochemistry are strongly recommended. Dettman DL, Kohm MJ, Quade J, Ryerson FJ, Ojha TP, Hamidullah S (2001) Seasonal stable isotope evidence for a strong Asian monsoon throughout the past 10.7 m.y. Geology 29: 31-34. Dettman DL, Lohmann KC (2000) Oxygen isotope evidence for high-altitude snow in the Laramide Rocky Mountains of North America during the Late Cretaceous and Paleogene. Geology 28: 243-246. Fan M, Dettman DL (2009) Late Paleocene high Laramide ranges in northeast Wyoming: Oxygen isotope study of ancient river water. Earth Planet Sci Let 286:110-121. Fastovsky, D.E., 1987, Paleoenvironments of vertebrate-bearing strata during the Cretaceous-Paleogene transition, eastern Montana and western North Dakota. Palaios 2:282-295. Gillikin DP, Lorrain A, Bouillon S, Willenz P, Dehairs F (2006) Stable carbon isotopic composition of Mytilus edulis shells: relation to metabolism and δ13C of DIC and phytoplankton. Org Geochem 37: 1371-1382. Gillikin DP, Lorrain A, Meng L, Dehairs F (2007) A large metabolic carbon contribution to the δ13C record in marine aragonitic bivalve shells. Geochim Cosmochim Acta 71: 2936-2946. Goodwin DH, Paul P, Wissink CL (2009) MoGroFunGen: A numerical model for reconstructing intra-annual growth rates of bivalve molluscs. Palaeogeogr Palaeoclimatol Palaeoecol 276: 47-55. Hartman, J.H., 1998, The biostratigraphy and paleontology of latest Cretaceous and Paleocene freshwater bivalves from the Western Williston Basin, Montana, U.S.A., in Johnston, P.A., & Haggart, J.W., eds., Bivalves: An Eon of Evolution: University of Calgary, Calgary, p. 317-345. Johnson, K.R., 2002, Megaflora of the Hell Creek and lower Fort Union Formations in the western Dakotas: Vegetational response to climate change, the Cretaceous- Tertiary boundary event and rapid marine transgression, in Hartman, J.H., Johnson, K.R., & Nichols, D.J., eds., The Hell Creek Formation and the Cretaceous-Tertiary boundary in the northern Great Plains: An integrated continental record of the end of the Cretaceous: GSA Paper 361, p. 329-391. Lund, S.P., Hartman, J.H., & Banerjee, S.K., 2002, Magnetostratigraphy of interfingering upper Cretaceous-Paleocene marine and continental strata of the Williston Basin, North Dakota and Montana, in Hartman, J.H., Johnson, K.R., & Nichols, D.J., eds., The Hell Creek Formation and the Cretaceous-Tertiary boundary in the northern Great Plains: An integrated continental record of the end of the Cretaceous: GSA Paper 361, p. 57-74. McConnaughey TA, Burdett J, Whelan JF, Paull CK (1997) Carbon isotopes in biological carbonates: respiration and photosynthesis. Geochim Cosmochim Acta 61: 611-622. Paul, P., and Goodwin, D.H., 2009, Bayesian reconstruction of intra-annual accretion rates. Geological Society of America, Annual Meeting: Portland, Oregon. Poulain C, Lorrain A, Mas R, Gillikin DP, Dehairs F, Robert R, Paulet YM (2010) Experimental shift of diet and DIC stable carbon isotopes: influence on shell δ13C values in the Manila clam Ruditapes philippinarum. Chem Geol 272: 75-82. Retallack, G.J., 1996, Acid trauma at the Cretaceous-Tertiary boundary in eastern Montana: GSA Today 6:1-7. Retallack, G.J., Leahy, G.D., & Spoon, M.D., 1987, Evidence from paleosols for ecosystem changes across the Cretaceous/Tertiary boundary in eastern Montana. Geology 15:1090-1093. Ricken W, Steuber T, Freitag H, Hirschfeld M, Niedenzu B, 2003. Recent and historical discharge of a large European river system – oxygen isotopic composition of river water and skeletal aragonite of Unionidae in the Rhine. Palaeogeogr Palaeoclimatol Palaeoecol 193:73-86. Versteegh EAA, Troelstra SR, Vonhof HB, Kroon D (2009) Oxygen isotope composition of bivalve seasonal growth increments and ambient water in the rivers Rhine and Meuse. Palaios 24:497-504. 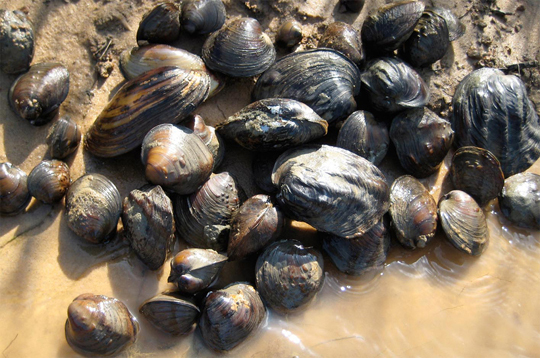 Versteegh EAA, Vonhof HB, Troelstra SR, Kroon D (2011) Can shells of freshwater mussels (Unionidae) be used to estimate low summer discharge of rivers and associated droughts? Int J Earth Sci 100:1423-1432.